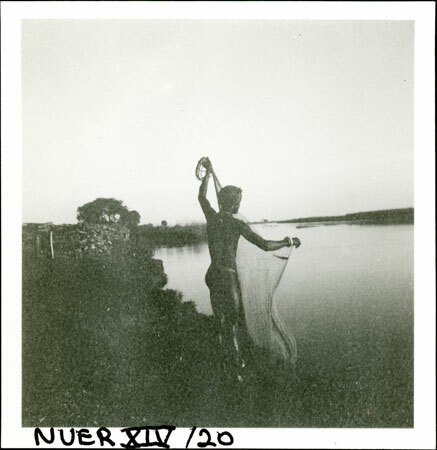 A dark image of a youth bringing in a net that he has cast into the Sobat River from the bank, near to one of the steamer wood-stations (visible beyond), probably near the confluence with the Nyanding tributary. Evans-Pritchard notes on another image that this is not a Nuer youth, presumably since net fishing was not favoured by them. Nuer fishing, as seen in other images, was normally undertaken with long harpoons whilst wading or canoeing in the rivers or inland lagoons, or else speared from specially constructed dams. Note on print reverse ms pencil - "04 2" & print front border ms ink - "NUER XIV/20"
Morton, Chris. "Net fishing in Sobat River" Southern Sudan Project (in development). 03 Jan. 2006. Pitt Rivers Museum. <http://southernsudan.prm.ox.ac.uk/details/1998.355.660.2/>.